Already owning two nice pair of binoculars, as well as a ranging monocular, you wouldn't think that I needed another pair of binoculars. 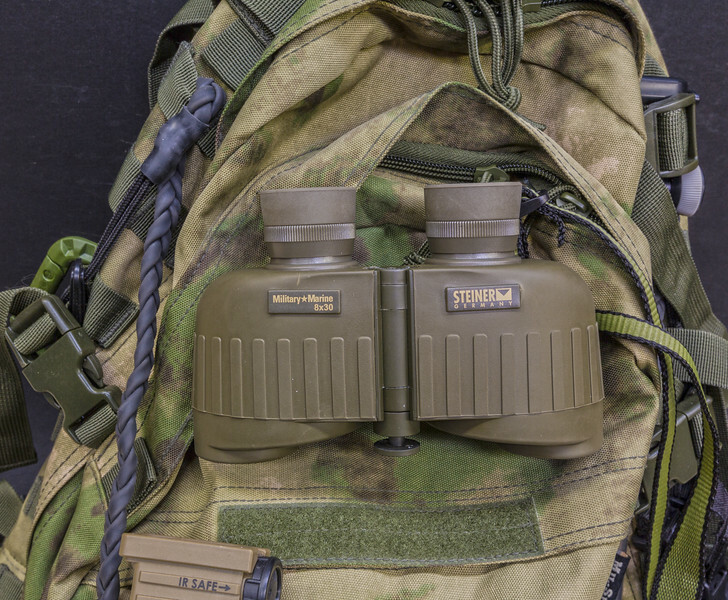 The two pair of binoculars that I have in my stable already, are very nice binoculars that have served me well for many years, and I expect them to continue to serve me well. However there is a reason why I had been looking at acquiring a third set, and in particular the Steiner Military & Marine 8x30 binoculars. Besides being very compact and light for an 8x30 porro prism design with superb optics, the main reason that I was attracted to them is the fact that you do not need to focus them at any distance between 20 yards (18 meters) and infinity! Now as I mentioned earlier, the reason that I was attracted to these binoculars is the fact that they are designed for extreme depth of field (DOF). They are great for viewing everything from about 18 meters (20 yards) to infinity with no focusing required (look close, there is no focusing wheel). Once you initially set the focus for each eye, that's it, they never need adjusting again. From there on in, you just hold them up to your eyes and see everything in focus at any range between 20 yards (18 meters) and infinity, that's it! After owning them for some time, I think they are great value for their compact size and their very good viewing. Being waterprooff and fog proof was also very important for my type of usage as well . Optically, this binocular performs way above its price class, and in spite of its porro prism design, it is amazingly compact and light, love them.